WHAT WAS LOST: Elsewhere, you'll be reading and hearing a great deal about the seven brave men and women who perished this morning -- and, elsewhere, you'll no doubt be seeing many angry chattering men and women, shouting to be heard over their colleagues about where to place the blame. And elsewhere, you'll find the conspiracy theorists scripting their comforting narratives, secure in the knowledge that nothing bad ever happens due to human error or incompetence, finding fingerprints of the Permanent Shadow Government all over the telemetry data -- which, not by coincidence, has already been seized and secured. But if you've wandered onto this page. pause for a moment to remember Petr Ginz -- a 14-year-old Jewish boy whose moonscape drawing might well have been a cover sketch for an issue of Amazing Stories in 1942. Instead, it was drawn for his own amusement while he lived for two years in the Theresienstadt concentration camp, prior to his execution at Auschwitz. Israeli astronaut Ilan Ramon carried this drawing aboard the Columbia. 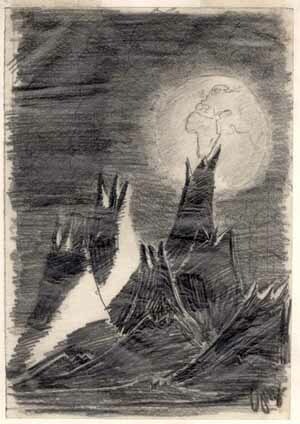 The moon landscape depicted in Petr Ginz’s drawing attests to his aspiration to reach a place from where the earth, which threatened his life, could be seen from a secure range. Even more so, the picture reveals a young man who, in addition to his other talents, was both a researcher and scientist full of optimism that science precedes all and would ultimately bring a remedy for humanity. Speaking to the New York-based American Society for Yad Vashem from the Houston, Texas Space Centre where he is in training, Ilan Ramon said, “I feel that my journey fulfills the dream of Petr Ginz 58 years on. A dream that is ultimate proof of the greatness of the soul of a boy imprisoned within the ghetto walls, the walls of which could not conquer his spirit. Ginz’s drawings, stored at Yad Vashem, are a testimony to the triumph of the spirit."